Hey y'all, it's been full of life around here and I haven't had a chance to write. Let me catch you all up to speed. 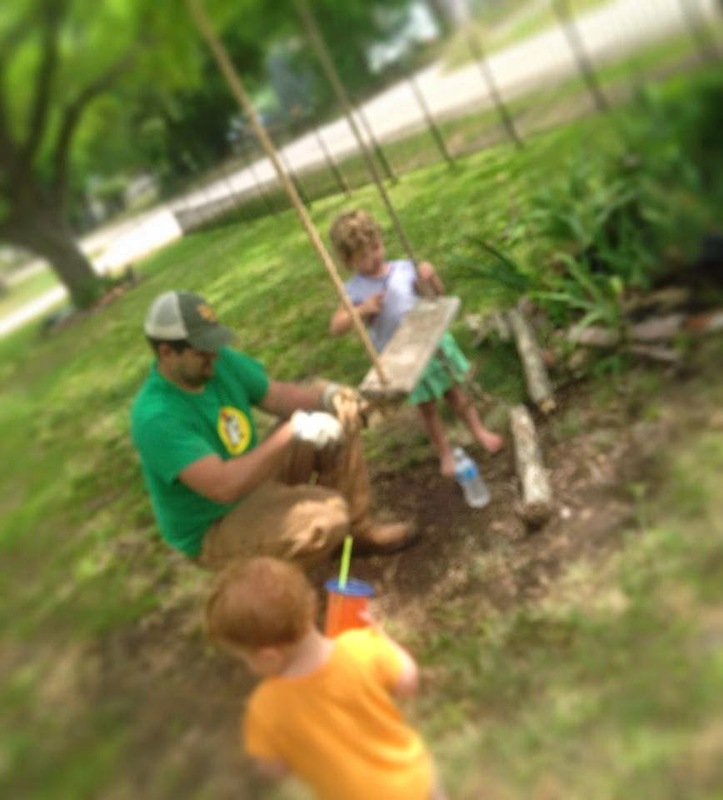 Over the past weekend, we had our Spring Work Day. About thirty-five people showed up to work. Tons of work was being done. They cleared about half of the brush and trees (some 45-50 foot tall) along our back fence line. They even cut a few things up for our neighbor. That may have made me get a little watery eyed. They completed the sheet rock in the guest room and most of the second floor dining room. My friend Amy provided all the lunch. It was fantastic. It made me cry as well. So, there you have it. Lots of people giving and serving as I weep. On Sunday, some of our favorite people were baptized and there was an after party. Who doesn't love a Holy Spirit after party. Then we went back to church to have a night of worship. It was wonderful and you could just sense the presence of Jesus in His beauty all around. Sunday night, our dear friend Charles came and spent the night. Perhaps you know about our bed debacle. I bought this 120 year old Louis the IV bed for the guest room. The box spring was a half inch to big for the bed. I had to laugh about it. What are the odds? One of the men who came on Saturday is a woodworker. He took the bed to his shop, fixed it, and drove it back to our house the next day. Can you believe the generosity of the saints? All of that to say, Charles had a bed to sleep on. We enjoyed him immensely and pray for him daily. He splits his time between inner city New Orleans and Thailand. He is currently preparing for his eighth trip to Thailand and would covet your prayers. Please pray also for his funding and support. On Monday, my family that I adopted came for a visit. You can read about them here. 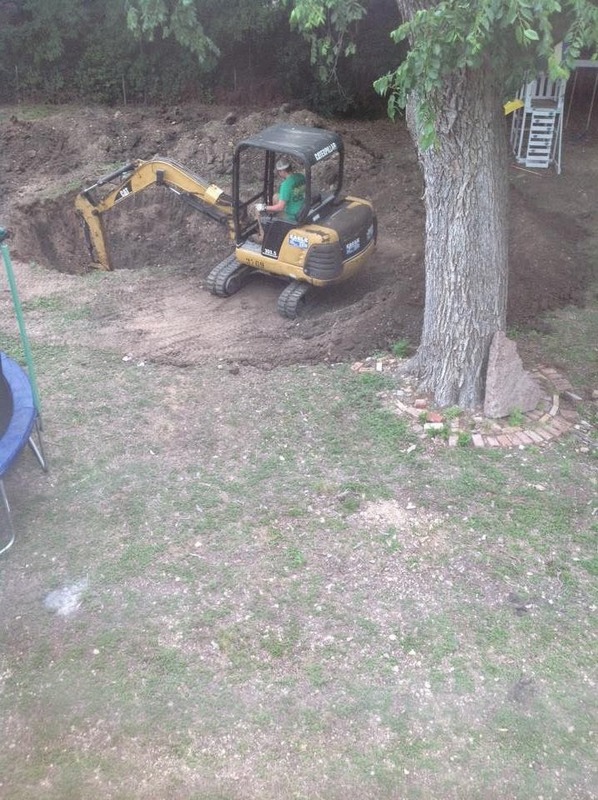 We rented a mini-excavator and dug a hole for our trampoline. 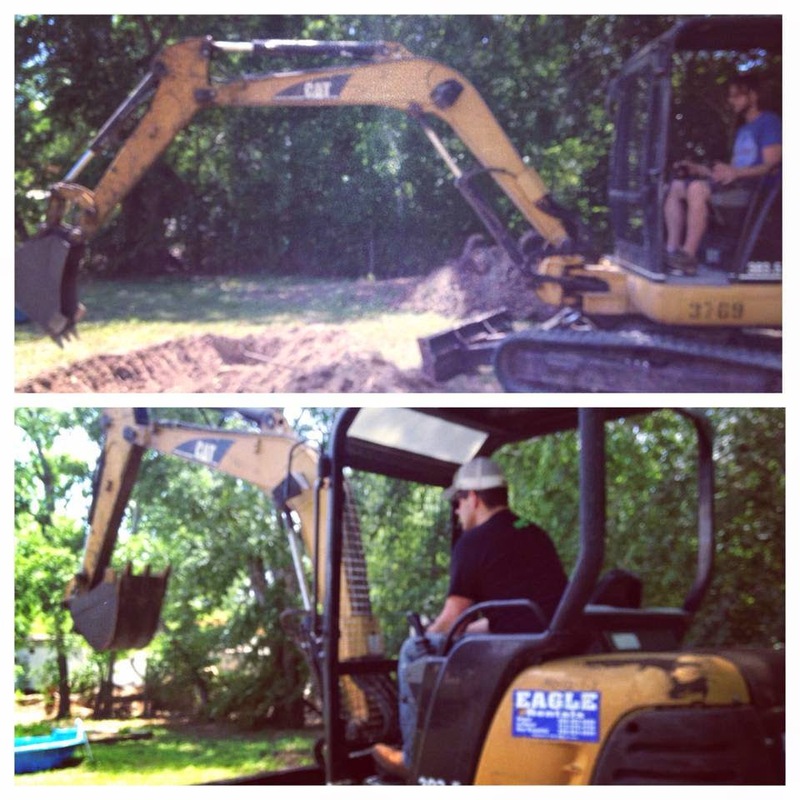 Stephen and Denbigh had the greatest time on that heavy machinery. It was the giddiness level of girls heading to prom. They just went around the yard looking for things to dig up. It was nice to get all of our old stumps pulled up. They may have dug the hole twice as deep as they needed and ended up having to fill it back in a bit. Oh the fun that was had. I was looking at the hole and became completely convinced that we could put in a pool. Maybe one of those fancy swimming ponds. Order the adirondack chairs, y'all. Lets dig another hole. Stephen also climbed a tree to fix a broken swing. My brother gave that swing to Lulu right before he died and it hurts me to see it laying in the dirt. Thankfully, my sweet brother hung it back up. I was asked to make this huge tree to go into the new hospital in New Braunfels. The staff are going to put thumbprints in green ink to make the leaves. I stayed up past midnight finishing it up. You can tell this by the fact that the bags under my eyes are touching my chin. On Tuesday night we had 19 people (12 kids) here eating and watching Frozen in the yard. What a great night of love and fellowship. Help us love people. Give to Gomer's House.